Advanced Arab Academy of Audio-Vestibulogy J.
Biomedical and Biotechnology Research J.
Community-acquired pneumonia (CAP) is the most frequent infectious disease, responsible for a great morbidity and mortality worldwide. It is known that poor outcome in CAP patients is not only directly related to pneumonia but also to comorbidities both during hospitalization and long term after discharge. Evidences show a high correlation between acute respiratory infections and increased risk of cardiovascular events (CVEs), such as acute myocardial infarction, arrhythmias, congestive heart failure, and stroke. The excessive systemic inflammatory response is responsible for hypoperfusion and activation of cytokines causing endothelial dysfunction, pro-coagulant effects, and atheroma instability. An established diagnostic tool to identify high-risk patients is not yet available, but cardiovascular biomarkers seem to be more effective than inflammatory molecules. Early identification of patients at higher risk for CVEs is mandatory to treat them effectively with prophylaxis medications, to establish adequate clinical surveillance and prevention with vaccinations. The present article reviews the epidemiology, pathophysiology, clinical presentation, risk factors, diagnosis, outcomes, and prevention of CVEs in patients hospitalized for CAP. Community-acquired pneumonia remains a major cause of morbidity and mortality globally. Streptococcus pneumoniae is recognized the main pathogen related to pneumonia in all site of care. 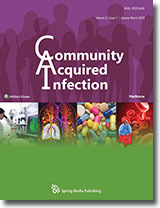 However, recent advances in molecular techniques have led to recognized that respiratory viruses are a common and important cause of severe CAP. Also, in the last 10 years new respiratory viruses are recognized as potential infectious agents in pneumonia. Recent studies show that in approximately 10 to 40% of pneumonia cases are involved viral pathogens being influenza virus the most common respiratory virus. A better knowledge of the role of respiratory viruses especially in cases of severe pneumonia may lead to better management of this population. This review aimed to describe the main respiratory viruses involved in severe pneumonia, specially focus in the clinical presentation, diagnosis, therapy and outcomes. Community-acquired pneumonia caused by Lophomona sp. Human infection with Lophomonas sp. a protozoan that parasitizes the intestinal tracts of termites and cockroaches is extremely rare; also clinical features are not fully understood. China is the country with the majority of cases reported in the literature. Here, we reported a case of Lophomonas sp. infection confirmed by tracheal aspirate on the microscopic observations. The patient was a 49-year-old male from a jungle city called "Madre de Dios" where he works as taxi driver and stonemason. He was admitted to the Intensive Care Unit on February 5, 2013, because the course with respiratory failure and hypoxemia, high fever, and generalized myalgias. The patient was successfully treated by metronidazole 500 mg t.i.d. for 17 days. This is the first case report of Lophomonas sp. in Madre de Dios city in Peru.